ZXR10 6800 series routers is an intelligent multi-service router promoted by ZTE, integrating routing, switching, wireless, security, VPN, Broadband user access in all. 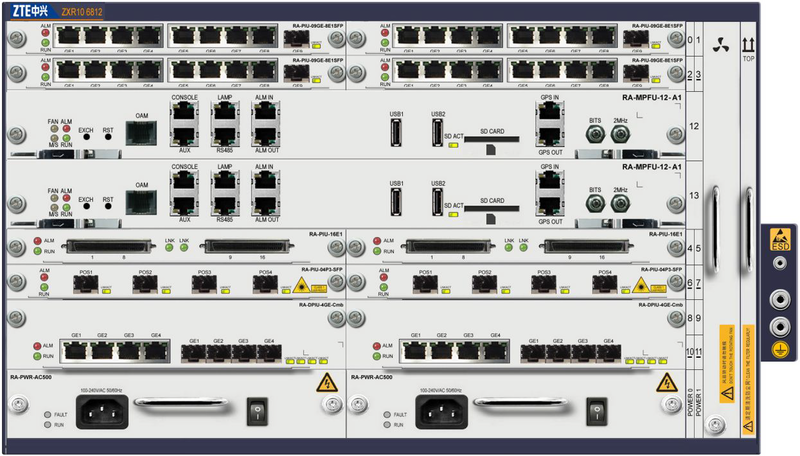 With modular, scalable system architecture, and Open Service Unit(OSU), it can constitute intelligent, efficient, reliable, and flexible IP network with easy maintenance. Forwarding plane and control plane separation and dual redundant design, which ensure safe and reliable of the equipment. “ALL in one” design concept, offering rich interface types and business functions, ZXR10 6800 can provide flexible functions customization and combination depending on the user’s requirement. A variety of MPFUs with different performance smooth upgrading to meet the user step-by-step investment demand, which minimize the cost of investment and construction of the clients on the network. ZTE ZXR10 6812 is Aggregation Service Router supporting 12 Line Card Slots and can be used as branch office integrated service router. The ZXR10 6812 14 service slots.